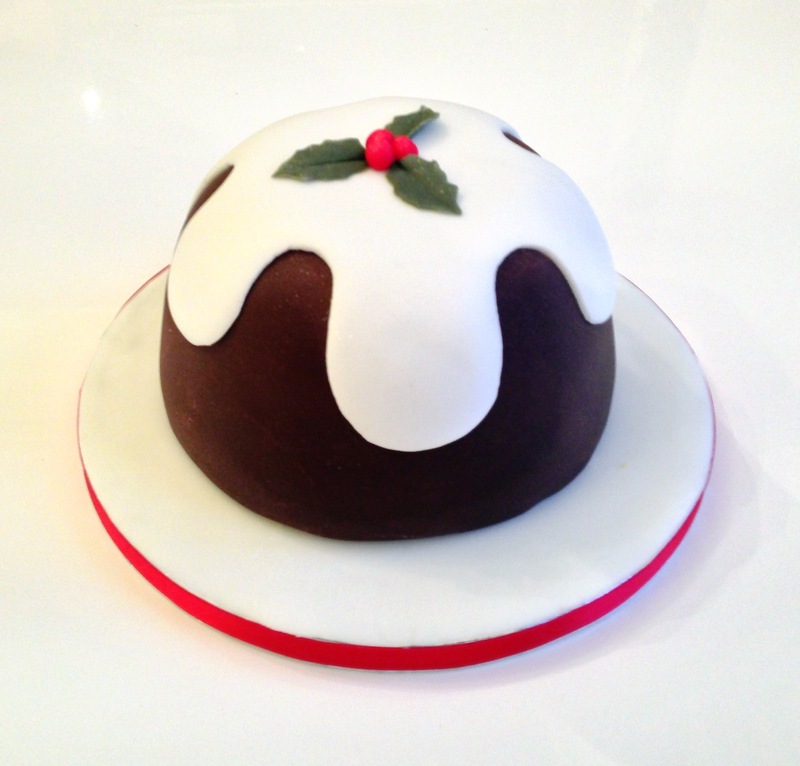 The Christmas Pudding cake was my second creation for this years Christmas Gift Hampers (see my previous post on the Gingerbread Man Christmas Cake). I had decided to try something a bit different this time by baking the cake in a Pyrex bowl to get the Christmas Pudding shape. I used the quantities as per my Fruit Cake Recipe for a 6 inch round cake. My main concern with this cake was whether baking the cake in a glass bowl would result in the outside of the cake burning before the inside was fully baked. I did some research and found several recommendations to place a metal flower nail, spike side up, in the base of the bowl – the idea being that the spike would then dissipate the heat up through the centre of the cake ensuring an even bake. I double lined the bowl with baking parchment – an achievement in itself. I ended up having to use an excessive amount of butter to adhere the parchment smoothly enough to the dome of bowl so as to avoid incurring too many large ridges in the cake surface that I would have to plug with marzipan later. I filled the bowl with cake batter up to half an inch below the lip of the bowl and covered with a baking parchment hat. Not knowing how long this would take to bake I set the timer for around one and a half hours at first, and then checked it again every fifteen minutes. It ended up taking a full two and a half hours (at 140°C) to bake through. I think that the flower nail must have worked though, as it appeared to be an even bake and the outer side of cake was not overcooked or burnt. When it came to decorating the cake I did the usual marzipan covering before applying the sugarpaste layer (wait at least a couple of days to let the marzipan layer dry out a bit first). I coloured the sugarpaste ‘bulrush’ brown. As you can imagine it took a lot of colour to get the deep brown for the pudding (almost the whole pot) and in doing so I learned a valuable lesson – don’t colour icing when you’ve got an important meeting the next day and you’re not entirely sure that the colouring will come off your hands in time. I even tried a Mary Berry tip and washed my hands in lemon juice, but that still didn’t remove the dirty brown staining to my finger nails. I cut the ‘custard’ topping out of some white sugarpaste using a template I had made from card. The holly leaves and berries I made using coloured Sugar Florist Paste and one of holly leaf cutters I had bought for last years Christmas Wreath Cake. To finish the cake off I dusted the top with some Ice White Lustre Dust to add some festive Christmas sparkle.